Helping people learn how to find the jobs they’d be gratified doing, is at the heart of MyHuntPath. This career management website, is not about placing the unemployed, in jobs, the archetypal way. The teams’ vision is to help people learn, how to look at themselves from a distance like a ‘Headhunter’ would, assess what they truly want, understand where they are in their career, determine where they want to be and find solutions and take suitable steps to reach that goal. They teach people to embark on a process that will elevate them from being mere job seekers to being their own headhunters. This is what makes MyHuntPath special, making it the single destination for a wide set of people, students, retirees, executives across levels, part time employees, young veterans, people wanting to return to the workforce, aspiring entrepreneurs and more. The team at MyHuntPath is enthusiastic and committed to kick start the new beginning of one’s job search process. 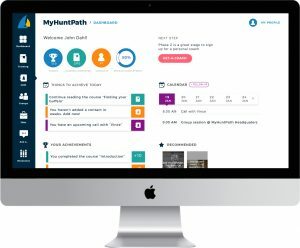 Envisioned by executive recruiters, MyHuntPath.com provides tools that include Training courses, a CRM to manage contacts, a Portfolio to save career related documents, interactive tools to collaborate with fellow job hunters and resource materials from the expert team to stay inspired. The site offers action plans to connect with the job hunters’ personal goals and network. Signing up with MyHuntPath, is a partnership for life, until retirement. The MyHuntPath team based in Cleveland, Ohio, is a trusted career partner to players in the accounting and financial services industry like Skoda Minotti, one among top 100 accounting firms in the US, top Universities in Ohio and even America’s noted social groups like Alpha Sigma Phi America’s 10th oldest Fraternity and Boys & Girls Club of America. MyHuntPath is a partner in the U.S Agency for International Development (USAID)’s Promote: Women in the Economy (WIE) program. The program, now in its second year, is bolstering women’s inclusion in Afghanistan’s economy and working to ensure that progress made by Afghan women over the past decade endures and advances. MyHuntPath is dedicated in playing its role as the key enabler in helping educated female jobseekers find placements and empower them to find ways to advance in their career. The MyHuntPath team wanted us, to give their existing website a new Design Direction, to ensure the new UI resonated the team’s vision. The many tools and modules needed to be reconstituted to enhance usability, and to be concomitant with the sequence of their use. The refurbished site had to satisfy critical parameters like increased ‘average time spent’, ‘conversion rate’ and increased site traffic by improving overall searchability. Team at ByteAlly, devised Design Values that brought out the site’s USP, called out user benefits, highlighted calls for action and tailored content to drive users to action. Our Design, Development and Quality Assurance teams worked cohesively, transforming requirements into features as efficiently and effectively possible. Their efforts were aimed at limiting quality and functional issues, improving overall health of the website, protecting site from potential vulnerability issues and analyzing website for impending penalties. We are mighty proud of MyHuntPath’s refurbished, multifaceted website, which we’d like to call the ‘Job Hunter’s Super Space’!